7th Infantry Bn, 2nd Brigade, 1st Canadian Division, C.E.F. 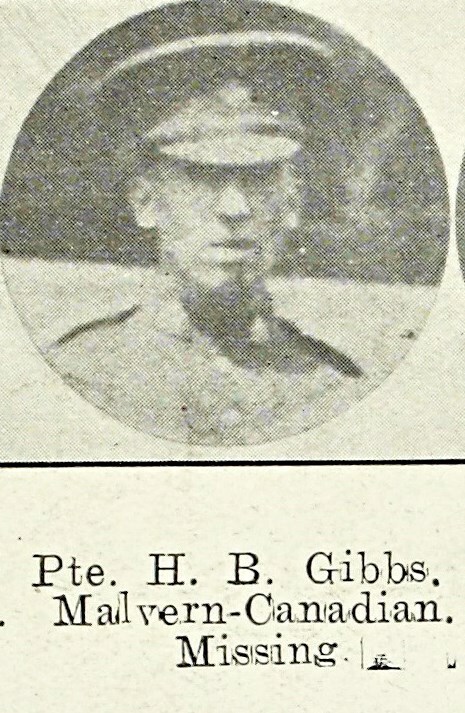 Horace Gibbs, the son of Mrs Kate Gibbs, was born in Newport on 15th October 1883. Sometime before the war he emigrated to Canada (probably to Fort Saskatchewan, Alberta) to stake a farming claim, at which, judging by his will, he was very successful. He had two brothers, Charles and Percival and three sisters Florence, Mrs Brenton-Cary and Mrs Hugh Wood (who was married to the proprietor of Southlea Preparatory School, Albert Road). He enlisted at Edmonton on the 4th January 1915 and was placed in the 51st Overseas Battalion. On the 5th May he was promoted Acting Quartermaster Sergeant. After fifteen months training in Canada, the battalion embarked from Halifax for England on board the SS Missanabie. For reasons unknown, when he disembarked in France in June he reverted to the rank of Private and was taken on strength of the 7th Battalion. During his time in France he wrote several pieces which the Malvern News described as “graphic word pictures” and several of his verses including The Question and The Ypres Trail were published.